Use this link when you shop at Amazon, Amazon will give 0.5% of purchase to HB. 0.5% of your Amazon purchases can go a long way to help funding the school! This year, our school will again be participating in the Box Tops for Education™ program. My name is Bethany Williams and I’m thrilled to be the new Box Tops Coordinator for H.B. duPont Middle School. Clipping Box Tops is an easy way for you to help our school buy what it needs. Box Tops are each worth 10¢ and they quickly add up to real cash for our school. This school year, our school’s earnings goal is $1,000. To help our school, just look for pink Box Tops on products, clip them, and send them to school. For more information on the Box Tops for Education program, including a list of participating products and our school’s progress, visit www.BTFE.com. Be sure to become a member to receive exclusive coupons and learn about extra ways for our school to earn. 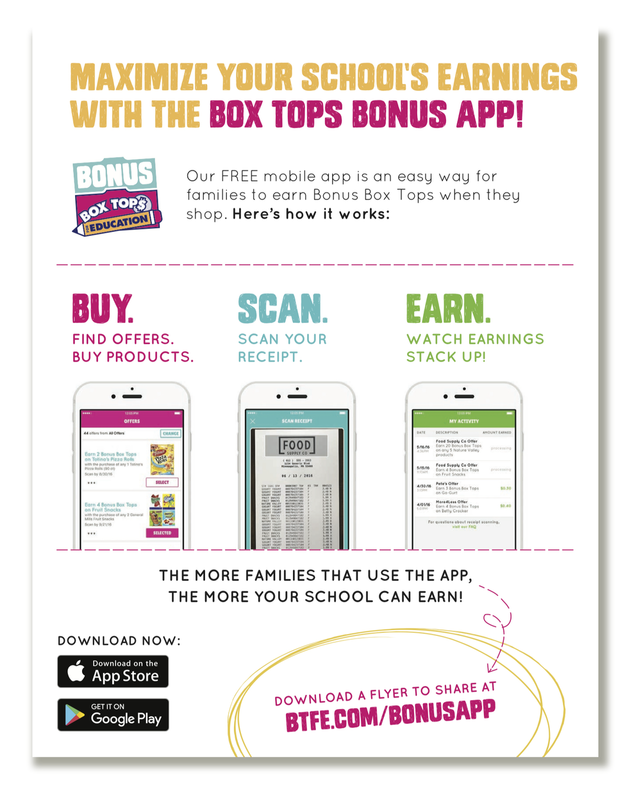 A new way to earn this year is by using their new Box Top Bonus App. Click here to see how to use and download the app. I hope you’re excited for everything we can do this year with Box Tops! I’m here to make our school’s Box Tops for Education program a huge success this year. P.S. We are also collecting Zingo receipts and they can be sent in with your Box Tops. If you shop at Zingos please save your receipts. HB will receive a percentage of all purchases made when we turn in receipts. Please put all receipts in an envelope marked "PTA/Zingos" and turn it into the office or students can put them in the Box Tops box in the cafeteria. HB duPont is also enrolled in the 5% Back to School Program with Office Depot. Each time you purchase supplies either at the store, by phone or online, please give them HB's number 70020399. Each quarter the school will receive a "merchandise card" which can be used like a gift card to purchase items for the school.